A parent of two, a UWO faculty member (French & linguistics), peace and social-justice activist and trade unionist feminist. Participated in the Gaza Freedom March in December 2009-January 2010, and the Canadian Boat to Gaza (tahrir.ca) campaign from June 2010 to present. Your fundraising messages have been coming thick & fast recently, but in case you haven’t noticed, many people aren’t donating so much to the NDP of late, for a variety of reasons. For many of us, it is hard to hear your persistent call for cash these days over the weeping of mothers and fathers of the Jabaliya camp in Gaza whose children were killed in the recent Israeli shelling of the UNWRA school where they had been told to go for safe refuge. I am among the growing number of Canadian voters who would like to support a party in parliament that stands clearly for human rights and international law, but can’t find one. For a bunch of reasons, both personal and political, it would be great if that party were the NDP. But right now the NDP is not rising to the occasion, and frankly, time is running out for your party to take a principled stand. Your latest fundraising message says “the clock is ticking”, and I agree: the time to take a stand for international law is now! We all know that many of your MPs have strong, principled positions but are not able to speak their consciences fully on the subject of Israeli crimes against Palestinian civilians, especially in Gaza. At times like these, that imposed collective silence seems a lot like complicity with war crimes. This eerie caucus uniformity is all the more troubling when MPs from the UK Labour Party (together with members from the Conservative-Liberal-Democratic government coalition) are able to speak their conscience freely and name Israeli aggression for what we all know it is. Similarly in Australia, Labour MPs have spoken out along with Green Party and independent MPs, and many social-democratic parties in Europe and elsewhere allow elected representatives to speak out against Israeli attacks on civilians. So by enforcing a single narrow “Israel first-and-only” line on all public statements, you are increasingly isolating the NDP among sister parties. Even some Democratic Party congress reps in the U.S. have gone farther than your party’s MPs are allowed to, at least naming the aggressor the world knows is responsible for the soaring death toll among Palestinians in Gaza. Your statements about the “conflict” are so detached from reality that you don’t even name who is responsible for the deaths of Palestinian civilians in Gaza. With the Harper government cheerleading for Israeli war crimes and Trudeau’s Liberals singing back-up, it would be very refreshing to offer concerned Canadian voters a real alternative. Just to be clear: your current silence about war crimes is not an alternative, and false “neutrality“ is not an alternative. And your repetitive mantra of “Israel’s right to defend itself” is most definitely not an alternative, especially when you never mention the legal responsibilities that go along with that right (i.e. the principles of distinction, precaution and proportionality). Bombing children in a UN school cannot ever be self-defense, under any understanding of international law. And yet you remain silent. When your caucus labour critic cannot stand with the Ontario Federation of Labour and the Confédération des syndicats nationaux in naming who is the aggressor responsible for so many civilian deaths, the NDP falls out of step with traditional labour allies and working Canadians generally. When your health critic cannot concur publicly with the diagnosis expressed by MDs in the Lancet and by Médecins sans Frontières about attacks on Palestine, then health professionals (among many others) observe seriously worrisome symptoms within the NDP. And when your Human Rights critic cannot take a public position in line with what the International Committee of the Red Cross or Human Rights’ Watch are saying about violations of international law by Israel, then your party loses any remaining shreds of moral credibility at home and abroad. Canadians need to see real leadership on this issue that names violations of international law for what they are, and calls for the application of the International Criminal Court to Israel. Until then we see such leadership, I will be standing with Canadians of conscience like Voters4Gaza – or sitting in with them, or perhaps even lying down and going limp (as my parents taught me) if necessary. But right now your failure to call for the application of international law in Israel and Palestine means I cannot support the party I was born into, and the only party I’ve ever voted for, federally or provincially. UN High Commissioner for Human Rights Navi Pillay said recently that “No individual or state can be considered exempt, if they violate the law.” Will you speak out today in support of the UN Human Rights Commission’s call for an independent, international commission of inquiry to investigate the conflict in the occupied Palestinian territories? Will you publicly support her call for accountability, “ensuring that the cycle of human rights violations and impunity is brought to an end.”? Time is indeed running out. It's been a long time, but I remember marching with you (and many others) in Toronto, against the Gulf War -- the first one, in the early 1990s. Back then we all went to Moxy Früvous gigs around campus, and listened your recordings. When I recently found a way to go back and play old songs we only have on cassette (remember cassettes?) I had an opportunity to explain to my kids that there was a Gulf War before the Gulf War that they knew about marching against. Last time we heard you perform, it was again your haunting "Gulf War Song" which you sang at the Pete Seeger tribute concert at Massy Hall in Toronto (later in the 1990s). You seemed pretty excited to be on stage with Pete, and we were vicariously proud to see you there too. In 2011 Pete joined the growing number of artists who publicly support the Palestinian call for Boycott, Divestment and Sanctions, which includes the cultural boycott of events that support the Israeli occupation. Like many of your former fans (we listen to your radio show too when we can, but in part because of the music from past decades), I am calling on you to do the same now. We'd be very proud and happy again if you would join Pete and the others in standing up for justice for Palestinians. This would of course mean turning down the invitation from Canadian Friends of the Hebrew University to appear at their event this week, an event which legitimates many aspects of that occupation. Awkward to turn down an invitation on such short notice, perhaps -- but nowhere near as "awkward" as the situation of Palestinian students at the Hebrew University. Those students and their federations (remember student federations Jian? unlike cassettes, they are still around) have already written to you in great detail about their conditions, so I will just point out that they (like so many other Palestinians, young and old) do not enjoy the freedoms you and I did as students. Freedoms to march, to perform their music and engage other cultural activities, freedom to their own cultural and political identities, even the freedom to study as they wish. Those Palestinian students will not win their rights this week or even this year, but as Pete sings in the "Maple Syrup Song" you covered for his 2001 tribute album, anything worthwhile takes a little time. The question is, will you stand with them now? You have a chance today to side publicly with justice and against oppression, cultural and political. A lot of your fans are hoping you will turn down this invitation, and I am among them. Some ongoing correspondence today about "(im)balance" in CBC "news" reporting. Thanks for following up with your second message: I have no record of receiving the first one you mention. - no words from any Palestinian in Gaza. Zero. This does not even come close to meeting any objective person's definition of "balance". If all Palestinians were in fact mute or unable to speak English, and there were no interpreters available anywhere to translate for them, this might "explain" the omission of their voices. But we all know that is not the case, so the omission can only be the result of editorial or journalistic decisions. - no graphic or other information provided by any Palestinian source. Again, these clear imbalances in sourcing can only have been the result of deliberate choices at some level, and certainly don't even come close to your stated goal of reporting in "a fair, balanced and even-handed fashion." The attempt to portray damage as somehow "equivalent" on both sides is grotesque, given what is and was widely known about the real death tolls. If as you say "allowing the expression of the widest possible range of views is at the heart of the notion of fairness and balance in journalism," it is inexplicable that no Palestinian voices and no Palestinian-sourced information was included in this report when Palestinian civil society is overflowing with articulate and reliable spokespeople being systematically ignored in your "news". There are many respected and independent sources of information by and from Palestinians in Gaza that you could've used, but chose not to: whether this was a journalist's choice or editorial control is less apparent, but it was definitely the result of choices made. Of course, I didn't get to watch The National every night that week, so maybe I missed something. Maybe you did run interviews with spokespeople from the Palestinian Human Rights Centre or Al Mezan Human Rights Centre or the Red Crescent Society for the Gaza Strip or the Gaza Community Mental Health Centre, or with some of the brilliant young Palestinian citizen journalists whose voices from Gaza were heard around the world (eg on CNN), and I just missed those segments. Maybe the imbalance was only apparent: this is an empirical question that is in your power to resolve. Since you have access to the full dataset, perhaps you can correct any misconceptions I might be suffering from here. - how many segments directly quoted (filmed) Israelis talking about the attack on Gaza, for how long and on what dates. - how many segments directly quoted (filmed) Palestinians talking about the attack on Gaza, for how long and on what dates. - how many Israeli sourced images were used (with or without voice-over), for how long. - how many Palestinian sourced images were used (with or without voice-over), for how long. When you provide this information, we can have a rational and objective discussion of what "balance" or "imbalance" might look like. I look forward to hearing from you. You wrote last November to Kirk LaPointe, CBC Ombudsman, about our Middle East coverage. (Since then Esther Enkin has replaced Mr. LaPointe as Ombudsman). I replied to your concerns some 10 days later. But looking through our records, it's now not clear if that reply was actually sent to you. If it was, I'm sorry to bother you with this note. If it wasn't, I offer my sincere apologies for the delay and thank you for your patience. Thank you for your e-mail of November 19 addressed to Kirk LaPointe, CBC Ombudsman, drawing our attention to our November 18th coverage of the recent Middle East conflict and what you take to be a “shocking imbalance”. CBC News carried “multiple interviews” with Israelis living with the threat of rockets, you wrote, but “none at all” with people in Gaza where the “real carnage is”. While I sincerely regret you are disappointed in CBC, I must tell you, respectfully, that your view here is not one I share. Regrettably, you only referred to a “news report”, so I hope I am correct in assuming you are referring to THE NATIONAL, CBC’s major television news program, widely seen on CBC Television and CBC News Network. Just to be clear, the program that evening began with a report from Sasa Petricic, CBC News Middle East correspondent, who described events that day – the deadliest so far, he called it – in the escalating conflict between Gaza and Israel. The report started in Gaza with video of what was a three story building flattened by Israeli missiles. The video depicted casualties being rushed to the hospital. Mr. Petricic said there were many, including children, some of whose inert forms were seen in the arms of an adult and on a hospital gurney. In all some 70 Palestinians had died, he said. The report included video of explosions and missiles hitting the top floors of a high-rise building in Gaza City, the offices of mostly Arab journalists, Mr. Petricic said. Then he turned to Israel depicting military equipment moving toward the Gaza border. An Israeli soldier was seen saying he wanted peace, while Mr. Petricic said a recent survey indicated most Israelis were not so sure, first they wanted an end to the rocket attacks. He said a rocket had hit an Israeli hospital while the video showed damage in other areas. He concluded with Israeli Prime Minister Benjamin Netanyahu talking about the possibility of further escalation. A brief copy story followed with a graphic demonstrating how Israeli defenses had intercepted rockets heading toward Israeli cities. In a second report on the program, CBC News Senior Correspondent Terry Milewski looked at the continuing efforts being made toward a ceasefire. CBC News has made every effort to tell Canadians about what’s happening in the Middle East in a fair, balanced and even-handed fashion. As I believe these reports did. Overall, I think it is fair to say that CBC has broadcast hours of thoughtful, thorough and innovative coverage of this conflict that has offered a wide range of perspectives, perhaps including those closer to yours. It is CBC’s mandate, part of its obligation under the federal Broadcasting Act, to carry different points of view on controversial matters of public interest and concern like this one. Indeed, allowing the expression of the widest possible range of views is at the heart of the notion of fairness and balance in journalism. It is CBC’s obligation to present differing views fairly and accurately affording Canadians the opportunity and the information they need to make up their own minds about the nature or quality of the views expressed. And I believe we are doing that. Thank you again for your e-mail. I hope my reply has reassured you of the continuing integrity of our news service. It is also my responsibility to tell you that if you are not satisfied with this response, you may wish to submit the matter for review by the CBC Ombudsman. The Office of the Ombudsman, an independent and impartial body reporting directly to the President, is responsible for evaluating program compliance with the CBC's journalistic policies. The Ombudsman may be reached by mail at Box 500, Terminal A, Toronto, Ontario M5W 1E6, or by fax at (416) 205-2825, or by e-mail at ombudsman@cbc.ca. I write to acknowledge receipt of your e-mail. It is the customary practice of CBC’s Office of the Ombudsman to share complaints with the relevant programmers, who have the right to respond first to criticism of their work. I have therefore shared your e-mail with Jennifer McGuire, General Manager and Editor in Chief of CBC News. If you are not satisfied with the response you receive you may ask me to review the matter. Programmers are asked to try to respond within twenty working days. yourComplaint: Your "news" reporting last night (and indeed all weekend and most of the week) was been shockingly imbalanced. You had multiple interviews with people living in Israel under the *threat* of *possible* death by rockets, and none at all with people living (and dying) in Gaza, where the real carnage is. There are lots of Palestinians living (though many dying) in Gaza: many of them are extremely eloquent and well-spoken. Why no attempt even to contact them, for a semblance of balance at very least? The indiscriminate terror bombing of Palestinian civilians and Israeli agression are well documented, internationally. Your complicit silence is extremely disturbing, from a Canadian perspective. I arrived to visit my dad on Friday April 13 in mid-afternoon. After declaring emphatically that he didn’t want to go for a walk (apparently he had refused earlier in the day too), dad eventually consented to go as far as the activity room to read the paper. We sang (My life flows on, and "Kisses sweeter than wine" with lyrics modified to reflect his life with mum, among other things). Drops of water turn a mill. (This is great walking song, which my sister Margie says is attributed to the foreword from a 19th century miners' union constitution according to liner notes from a Pete Seeger album. There is some different history with a great performance by John McCutcheon here). After our return (the whole excursion to the corner of the driveway and back took about an hour, maybe 40-60 meters total traveled) he wanted to sing more, so we did. After repeating How can I keep from Singing, he remarked “you seem to have recovered pretty well from your experience (long pause) on the boat” – this from someone who an hour earlier had been unable to remember my brother Danny’s name or mine, or even the word “brother” to describe our relationship (“You two, same mother, right?"). Uncharacteristically, I was not wearing any sort of political t-shirt or even a button as a clue, and my boat experience would be neither in his immediate memory, nor in his well-laid-down distant memories, and there are no immediate print cues around either (I later printed this account out for him to read, or have read to him). The song was of course connected to my boat experience for me (but not so much for him), but not very recently -- it had been sung much more recently at mum's memorial). Dad’s acceptance of a walk (or any activity) seems to be conditioned by luck as well as stubbornness, but as my brother Danny points out, stubbornness helps create opportunities for luck. As luck (¿?) would have it, dad turns out to be related to some stubborn people. and the effect of Justice quietness and confidence forever. Response For my Salvation is near to come and my Justice to be revealed. Wife, mother, grandmother, great-grandmother; Christian, pacifist, socialist, feminist, community activist and organizer extraordinaire. Died peacefully of complications following pneumonia after a brief hospitalization at Mount Sinai Hospital in Toronto. Alice is survived by loving husband Don (Dan), her inseparable partner in faith and in social justice causes for more than 61 years. Also survived by sisters Margaret Boomhour, Muriel Holmes, Irene Lathe, Ruth Coburn, and brother Lawrence Boomhour. Sorely missed by daughters Margaret (Serge Lalonde), Eleanor (Terry Quance), Susan (Pascal Laforest) and sons Harold (Hilary Dickson), Danny (Carol Schwartz), Andrew (Elizabeth Rainsberry) and David (Stephanie Kelly), and by grandchildren Rachel, Miriam, Michaël, Amanda, Tia, Katie, Odile, Évelyne, Marie-Hélène, Rian, Hannah, Eric, Danni, Nicolás, Felipe, Thomas and Steven, and great- grandchildren Dylan and Grace. Predeceased by brothers Robert and Charles Boomhour and by grandson Jesse Cohen. Fondly remembered by countless others who were embraced by her radical hospitality, her practical solidarity and her boundless love over the years. After high-school, Alice attended the United Church Training School in Toronto (affectionately known as the Angel Factory) and McGill University in Montreal, where she became close to, and eventually joined, an extended family of Marxist Anglicans, the Society of the Catholic Commonwealth (SCC). She led her fiancé Don in converting to the Anglican Church. She also took part in Student Christian Movement (SCM) student-in- industry summer work-camps, worked in factories and participated in organizing drives with now legendary Québec trade-unionist and feminist Madeleine Parent, among others. In 1948 Alice attended the founding meeting of the Canadian Peace Congress in Toronto. In 1950 she was banned from traveling to the United States, though she ignored the ban for unauthorized personal, religious and political visits there. She worked with the Church Peace Mission and Easter Peace Marches until the mid-1960s and on the White Poppy campaign for Peace until 2009. 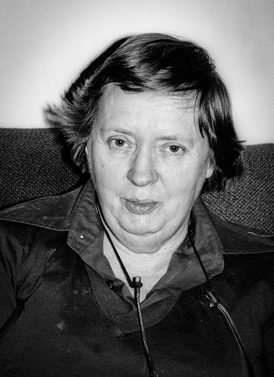 While raising a large family and welcoming SCM work-camps, war resisters, civil rights activists, farm-workers and many others into a home where the door was never locked, Alice worked at different times for University College, for the Toronto Public Library (Yorkville Branch), for the Visiting Home-makers Association and for housing co-ops including the Kalmar Co-op and Alexandra Park Co-op, where she was a member of the Communications, Energy and Paperworkers union. While remaining in comradely dialogue with many friends in and out of the Labour Progressive (later Communist) Party, Alice joined the Cooperative Commonwealth Federation and later the New Democratic Party, where she served many organizing functions in local riding associations as well as being elected to the Provincial Executive as a socialist caucus delegate. She was recognized with a Bishop's Award for Faithful Service in 2000 for her steadfast work at Holy Trinity Church in areas such as social housing, a support group for released offenders, and anti-poverty work (she continued at weekly People’s Presence until the year of her death). Donations in Alice’s memory can be made to any of many causes dear to her heart, including but not limited to: the Advocacy Centre for the Elderly, the Canadian Council for Refugees or the Christian Peacemaker Teams. Many friends rallied around in support as age and infirmity set in. The family is grateful to three in particular - Marty Crowder, Abraham Blank and David Chong – who attended faithfully to Alice, in addition to the dedicated care she received at Kensington Gardens and from front-line workers elsewhere. A parent of two, trade unionist feminist, peace and human rights activist. Participated in the Gaza Freedom March in December 2009, and the Canadian Boat to Gaza campaign from June 2010 to present. Day job: teacher-researcher aka Associate Prof at the University of Western Ontario (French & linguistics), interested in formal representations of variable pronominal morphology in nonstandard Romance dialects (among other things), but teaching whatever comes my way (including Language & Gender).